In the 1990s, Vienna's Jews and queers abandoned their clandestine existence and emerged into the city's public sphere in unprecedented numbers. Symptoms of Modernity traces this development in the context of Central European history. Jews and homosexuals are signposts of an exclusionary process of nation-building. Cast in their modern roles in the late nineteenth century, they functioned as Others, allowing a national community to imagine itself as a site of ethnic and sexual purity. 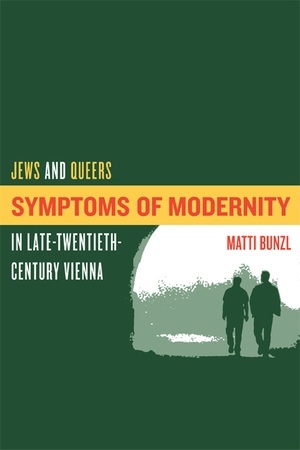 In Matti Bunzl's incisive historical and cultural analysis, the Holocaust appears as the catastrophic culmination of this violent project, an attempt to eradicate modernity's abject by-products from the body politic. As Symptoms of Modernity shows, though World War II brought an end to the genocidal persecution, the nation's exclusionary logic persisted, accounting for the ongoing marginalization of Jews and homosexuals. Not until the 1970s did individual Jews and queers begin to challenge the hegemonic subordination—a resistance that, by the 1990s, was joined by the state's attempts to ensure and affirm the continued presence of Jews and queers. Symptoms of Modernity gives an account of this radical cultural reversal, linking it to geopolitical transformations and to the supersession of the European nation-state by a postmodern polity. Matti Bunzl is Associate Professor of Anthropology and History at the University of Illinois at Urbana-Champaign, where he also directs the Illinois Program for Research in the Humanities.